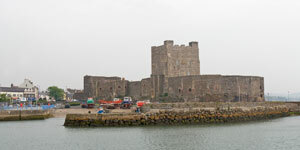 Carrickfergus Castle is along the coast just east and north as you drive from Belfast along the A2. It is one of the first and largest castles in Ireland and is in very good condition. If you are touring Northern Ireland, you can see Belfast Castle during your visit to the city and then stop at Carrickfergus Castle as you head north along the Antrim Coast to the Giant's Causeway and Dunluce Castle. 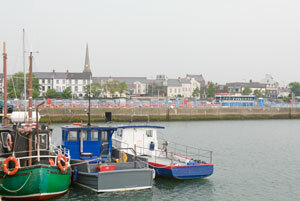 The castle is built along the shore of Belfast Lough and the rocks of the coast. Three castle areas, called "Wards", were built during the castle's history. John DeCourcy built the Inner Ward between 1180 and 1204 to start the Anglo-Norman control of Ulster. This inner section is the main structure built for defense on the shore and included a moat and drawbridge which was pulled up to surround the castle with water. The four-story "Keep" is part of the Inner Ward and includes the living quarters. The castle was captured by King John after a battle in 1210, and the Middle Ward was built between 1216 and 1224 to strengthen the castle. The wall is mostly in ruins, but there were towers and a gate with a door to the sea. Hugh de Lacy added the Outer Ward during his rule between 1228 and 1242. You enter the Outer Ward through the entry gatehouse when you tour the castle. The gunports, canons, chapel, and officers' quarters are located in the Outer Ward. 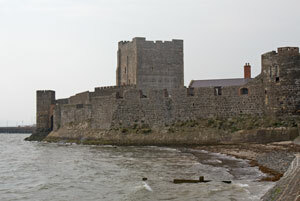 The English retreated to Carrickfergus when Edward Bruce and the Scottish forces invaded Ireland in 1315. The English held out in the castle for one year, but finally surrendered to the Scottish in 1316. Bruce controlled the castle until he died in 1318 in the battle near Dundalk in County Louth. The castle was used for English administrative purposes in the Middle Ages. 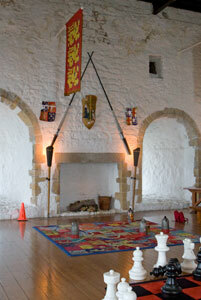 More additions for battle were made in the 16th century, and more fighting took place. The ghost of a young 16th century soldier named "Buttoncap" is said to still haunt the castle! The castle was in disrepair when Frederick Schomberg took control for William III in 1689. 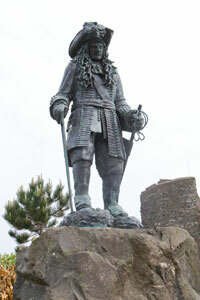 Thurot, a French commander, captured the castle in 1760. 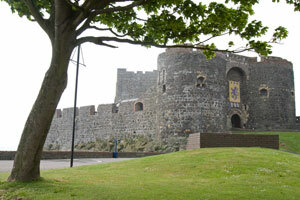 Carrickfergus Castle was used as a prison in the 18th century and an armory until 1928. The Keep was used as an air-raid shelter in World War II. The Environment and Heritage Service maintains the castle today. 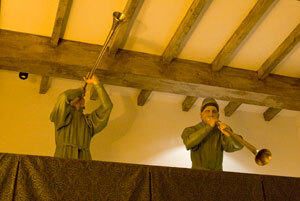 Throughout the castle tour, you will see "people" doing their work with the canons, guns, and crossbows. 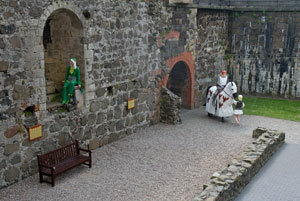 You will even find John de Courcy and his wife Lady Affreca at the castle. Information displays are found throughout the castle during your self-guided tour. Guided tours are also available. When you finish your tour, get a look at the outer walls from the western side and, if the tide is low, from the beach on the east side. A banquet hall at the castle is available for parties including weddings. The castle is easy to find on the A2 highway east of Belfast.